It's funny how so often the songs that are basically afterthoughts end up defining an artist's music career. A song that's dashed off in 10 minutes becomes a monster hit, a cover version eclipses any of the act's original songs or a last-minute addition to an album turns out to be the best-selling single lifted from it. This week in 1986, two singles debuted on the ARIA top 50 that would be among the artists' biggest releases. One was a massively successful remake by a singer who'd never released a cover before and the other was a song that rounded out an album's tracklisting in the final stages of recording. Both would vie for the number 1 spot, taking turns at the top throughout February 1987. The song at number 1 this week in December 1986 was still "You're The Voice" by John Farnham, which spent its sixth week on top while Chris De Burgh's "The Lady In Red" had to settle for a second week at number 2. The title track of Eye Of The Zombie had reached the top 30, but there was little love for this Creedence Clearwater Revival-sounding follow-up for the band's former lead vocalist. They'd enjoyed a run of successful singles in the previous couple of years, but this True Stories track brought an end to that and to Talking Heads' top 50 career entirely. Time for some Eurodisco, and this 12" only release from German artist Mike Mareen, who'd have some Continental success the previous year with "Dancing In The Dark". Their first single - the title track from debut album Voices Carry - had been big locally, but this lead release from Welcome Home didn't provoke the same reaction, although it was a US top 30 hit. It'd been four years since Joan Jett's trio of hits from I Love Rock 'N' Roll. Three albums on, her band still struggled to match that success despite the promise offered in the title of this single. I wonder how this rousing ballad might've done if it'd come with a music video. Despite being a highlight of Billy Joel's 1980s output, it fell 70 places short of previous single "A Matter Of Trust". A strange thing happened in Australia with this second single from Spandau Ballet's fifth album of the same name. 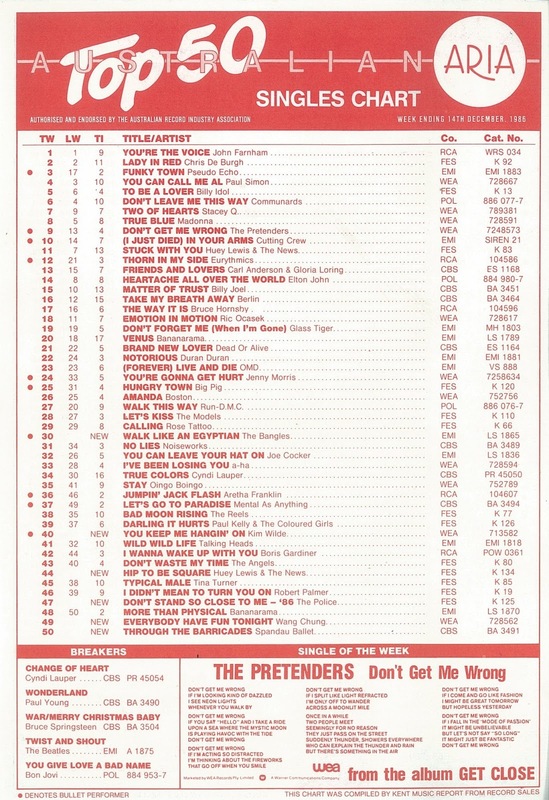 After the mediocre "Fight For Ourselves" had performed as you'd expect a new single from the band to and reached the top 20, epic ballad "Through The Barricades" barely made the top 50 and spent the seven weeks after this stuck between numbers 51 and 60. In most other countries where the band was successful, the song improved on the performance of "Fight For Ourselves" - in the UK, it was Spandau Ballet's 10th and final top 10 hit. So what was Australia's problem with "Through The Barricades"? It can't have been that it was a ballad, since their biggest hit, "True", had also been one. Perhaps it was too serious and its subject matter about a romance between a young couple from opposite sides of the conflict in Northern Ireland didn't connect locally. Whatever the reason, it was an anticlimactic end to the band's top 50 career on the ARIA chart. "Dance Hall Days" had given Wang Chung their first Australian top 10 hit in 1984 - and they repeated the feat with this party starter which was inescapable all summer, ultimately spending 12 weeks inside the top 20. The song, which had started out as an ironic ballad, came with an astonishing music video directed by Godley & Creme, which made use of quick edits between similar takes to produce the juddering, motion sickness-triggering effect. Primarily the duo of singer Jack Hues (real name: Jeremy Ryder) and bass player Nick Feldman, Wang Chung had started out in 1980 as Huang Chung (the Mandarin for "yellow bell" or perfect pitch in music), but changed their name when they moved from Arista to Geffen Records. And to answer the question posed by "Everybody Have Fun Tonight" - "can you tell me what a Wang Chung is?" - well, don't ask the band. Nick says, "Wang Chung means whatever you want it to mean. It represents an abstract, an escape from pragmatic, complex ideas." OK, then. In the first half of the '80s, The Police had been untouchable, with four straight number 1 albums and six top 10 singles. Inevitably, such mammoth success led to the band imploding. By the middle of the decade, the trio had fallen apart, unable to work in the studio together beyond this updated version of their number 3 hit from 1980. "Don't Stand So Close To Me" was never a favourite of mine, but if forced to choose, I'd opt for the original version rather than this reworking, which also came with a music video directed by Godley & Creme. It seemed I wasn't the only one who didn't think so much of "Don't Stand So Close To Me '86", which became only a minor hit in Australia to coincide with the release of a greatest hits collection, Every Breath You Take: The Singles. The releases signalled an end to The Police's impressive career... until the obligatory reunion two decades later. Years before it would feature in a pivotal scene in both the book and film of American Psycho, "Hip To Be Square" was just the latest radio-ready pop/rock smash from Huey Lewis And The News, the follow-up to number 2 hit "Stuck With You". And yes, it pretty much summed up the popular band's safe, wholesome image. It was also another song that came with a music video directed by the busiest duo in pop: Godley & Creme. For the ultra-close-up shots seen in the clip for "Hip To Be Square", the type of medical camera that gets inserted inside people's bodies was used. Meanwhile, the backing vocals at the end were provided by players from the San Francisco 49ers football team. It's one of the oldest tricks in the pop music book - when your chart career has run out of steam, record a cover version. Kim Wilde had kicked things off with four top 10 hits in Australia in 1981-82, but her most recent appearance on the top 50 had been with 1983's "Love Blonde", which peaked at number 32. When "Schoolgirl", the lead single from her Another Step album in Australia and a few other countries, failed to reach the top 100 at all, there was only one thing to do - release her dramatic update of The Supremes' classic from 1966. Kim turned the Motown tune, which had only reached number 29 in Australia but topped the US chart, into a Hi-NRG stormer which raced to number 1 locally and once again in America. As we'll see, unfortunately Kim's next few singles were nowhere near as strong and by the time she and brother Ricky, who wrote and produced most of her material, came up with songs to equal "You Keep Me Hangin' On", Australia had moved on. The other single that tussled with "You Keep Me Hangin' On" for the number 1 spot throughout February 1987 was the second big hit for The Bangles. Like "Manic Monday", "Walk Like An Egyptian" was written by someone outside the band, in this case Liam Sternberg, whose other claim to fame is composing the theme tune for 21 Jump St. The song had previously been offered to Toni Basil and Lene Lovich before ending up with the girl band and, unlike many of The Bangles' singles, the track showcased the lead vocals of three members - Vicki Peterson, Michael Steele and Susanna Hoffs respectively. Drummer Debbi Peterson, meanwhile, was relegated to tambourine (and whistling) since a drum machine was used on the song. As well as exacerbating tensions between the band over who did what, the quartet weren't thrilled that what is almost a novelty record became one of their biggest hits - the number 1 song of 1987 in the US and the year-end number 7 in Australia. Next week: The Bangles provide backing vocals for another top 50 entry, while a song that reached number 5 in 1964 returns to the chart. Plus, a new single from a man who'd scored seven top 50 hits from his previous album. The Mike Mareen track sounds rather like Trans-X's 'Living On Video'. The 'Til Tuesday track is pleasant, but not spectacular. I recognise the chorus of the Billy Joel track. It definitely got plenty of airplay in Melbourne. I guess he was typically more of an 'album' artist. I like the Wang Chung song for what it is, but it sounds more dated than an almost-1987 song. Other than fulfilling a contractual obligation, I don't see what the point of the '86 remix of 'Don't Stand...' was. It's a shame Kim Wilde's only real hits locally, after her initial top 10 streak, were cover versions. That being said, 'You Keep Me...' has to be one of the best re-makes ever, I think, and adds a new, darker dimension to the song. I've always thought she looks so much like Terminator 1-era Sarah Connor in the video, though, with that 'do. A great run of Oz #1's with 'Venus', 'You Keep Me Hangin' On' & 'Walk Like an Egyptian'. As much as I like the Bangles' version, I kind of wish Toni Basil & Lene Lovich had recorded it (demo or otherwise), as I'd love to hear what they could both do with it. Susanna's side-eyes in the video are quite unintentionally funny. Surprised through the barricades performed so poorly for a really decent ballad. Should've went at least into the top 20. Shame it was their last top 50 single, this would be one of my favourites by them after Gold & Communication.